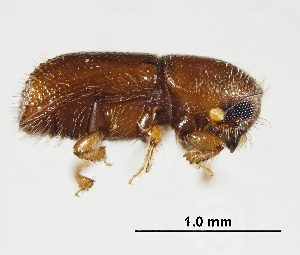 Undescribed species of Cyrtogenius, photographed by Jiri Hulcr. Cyrtogenius is a genus of bark beetles found from Africa to Micronesia; members of this genus are phloeophagous and heterosanguineously polygynous (Wood 1986). Characters (from Wood 1986): Antennal club with suture 1 weakly to profoundly procurved, rarely with sutures absent and pubescent to base, posterior face with only one suture indicated; funicle of small species with as few as three segments, most four- or five-segmented; pronotum with dorsal profile evenly arched, summit indefinite, anterior half of pronotum declivous and armed by asperities; procoxae narrowly separated, rarely intercoxal piece longitudinally emarginate, commonly with ventrolateral margin of declivity slightly elevated or armed; scutellum rather large, flat. Male of normal size, joining female in new parental gallery.